Rangihoua Estate was founded by Anne Stanimiroff and Colin Sayles. The initial inspiration for the business had come when Stephen White, owner of Stonyridge Vineyard, challenged them to make olive oil – initially from the Stonyridge olives. Further research and experience was gathered on a trip to Italy in May 1996. A chance encounter in a wine bar across the Ponte Veccio Bridge in Florence, led to Anne and Colin being invited to Sunday lunch at a local farm – Podere Valdibotte. The table was set out in Helene and Gincarlo’s olive grove and laden with course upon course of delicious fresh Italian food – all of course drenched in the farm’s gleaming green peppery olive oil. Later that same year Colin returned to Podere Valdibotte to help with the harvest and milling of the olives. He left with a 5 litre jar of fresh olive oil and managed to nurse it 36 000 miles back to NZ. Back home he poured the fresh green olive oil out and announced to friends and family “if we can produce olive oil like this, then we’ll be in with a chance”. The relationship has continued with Valdibotte and Anne and Colin continue to visit Italy and enjoy their lovely hospitality at the farm B&B Podere Valdibotte. 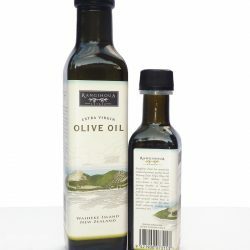 In April 1997 the inaugural harvest began and the first olive oil was made on Waiheke Island by Rangihoua Estate. 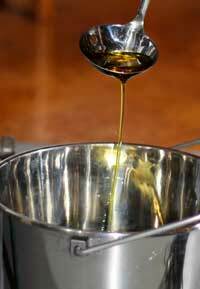 The resulting oil was green, herbaceous and peppery – perfect! Since then they have produced outstanding Extra Virgin Olive Oil of international acclaim. They manage 4200 olive trees all growing on Waiheke Island. In 2013 Rangihoua Estate was ranked ‘Best 20 in the World’ by Flos Olei – The Italian Guide to the World’s Best Extra Virgin Olive Oil. Every year both International and National Gold medals have been awarded to their Extra Virgin Olive Oils. Today Rangihoua operates tours & tastings all year round concentrating on educating the public on how olive oil is made, what makes it Extra Virgin, the way it enhances food and the enormous health benefits. Visitors become part of their ever growing following of fans who order online. In 2010 they expanded their market and are now also exporting to Japan. 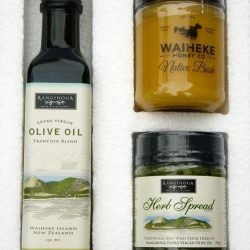 Rangihoua Estate, Waiheke Island: where else in the world can you find four of the world’s best olive oils in one place? Call us now to arrange a visit and enjoy a tasting or order some of our olive oils online. All the olives are hand picked at the optimum level of ripeness, using small hand rakes to comb the olives off the tree. Within 24 hours of picking the fresh olives are processed and pressed into olive oil using an olive oil mill especially imported from Italy. In 2002, the volumes of olives for processing increased dramatically and Rangihoua Estate purchased a new olive oil mill, capable of processing 500kg of olives per hour. The Pegaso works on the same principle as the oliomio with centrifugal separation. The Pegaso has been engineered by an Italian firm in Florence, Officine Meccaniche Toscane, who have been making olive processing equipment for over a century. The Pegaso is designed to the highest specifications and Rangihoua is proud to be associated with this company and delighted with the Pegaso performance. New Zealand was settled by the Maori people way back in the 1200s, and many place names in New Zealand are named after significant events in history. The name Rangihoua means ‘The Day of Renewal’ and is the name of the land where the main Olive Grove of 1000 trees is planted and where the Frantoio tasting room is situated. Approximately 600 years ago the Maori canoe called ‘Te Arawa’ landed at the coastal inlet below the Rangihoua mountain for rest and repairs at the end of her migratory voyage. Here she was relashed, hence the name ‘the day of renewal’ before the canoe carried on in its voyage to the Coramandel Peninsula. Waiheke Island is a small island situated in the Hauraki Gulf of the coast of Auckland. Waiheke is 93.2 square kilometres in area and has 128 km of coastline. It is a relatively undeveloped Island, with only 7000 fulltime residents, but is becoming one of New Zealand’s top tourist destinations. Waiheke has been described as a little Mediterranean jewel nestled in the Hauraki Gulf, 19 km from Auckland City. Surprisingly it is on average two or three degrees warmer than Auckland, and has about 30% less rainfall. These factors make it perfect for the olives and grapes alike. With it’s unique micro-climate it has a long, dry, hot summer essential for ripening olives. Rangihoua Estate also operates the popular Waiheke Aqua water supply business that delivers bulk water to homes and properties around Waiheke Island. 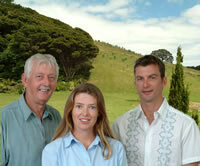 Waiheke Aqua is a very busy team during the hot and dry Summer months, when rainfall is at its lowest. Did you know that the vast majority of homes on Waiheke rely on rain water collection for all their water needs? It’s true! Only a small percentage of Waiheke residents (in and around the main village on Oneroa) are connected to a mains water supply. The rest of the island must “harvest” rain water from their roof and store in large water tanks. Whilst this works well for the majority of the year, most households start to run dry after 4 – 8 weeks of drought – which is a common occurrence between the months of December to April.